solo mining? is there such? you can use the Wallet to solo mine but network wise wouldnt recommend it. best is to make own pool and connect to that for solo mining if you have enough hashing power. More new exchanges, like Stocks. exchange, South.exchange, and Shardax should be taken into consideration in near future plan of Stellite project, dev. cant say which exchanges are planned as that would been breaking a NDA if that was the case. Project is alive and kicking more news will come soon upcoming week(s). Excellent. Looking forward to it. I`m seening the growth of this project since it started. Before there were few fupporters and investors on the platform. But now, they`re starting to grow eventually i know they can grow bigger by end of the year. Dev having problem with Gui wallet it say daemon failed to start some sort of log error and it says (Please check your wallet and daemon log for errors. You can also try to start stellited.exe manually.) Having trouble trying to figure out? Ok so i download new wallet wiped it i dont get the error message but now wallet wont sync says its disconnect? Been following this project from day one, I can definitely say that there is a solid team behind Stellite; hope to see it in the top 200 until the end of the year. check if you can run stellited.exe if not or its not there exclude folder from antivirus redownload wallet and extract in same directory. We have just added support for Stellite to our Crypto Mining Profitability Calculator: https://crypt0.zone/calculator/! Feel free to send us some feedback. Yeah stellite.exe is loading blockchain so am i all good? Stellite will be having a Hard Fork we plan for next week to V4 or as we like to call the Titanium Fork, this is to make some great improvements to our network. So let's dive into the major changes we've made to the source code with this hard fork. at the time it was not easy for us to get our algorithm supported by some of the major miners like xmrig and xmr-stak but now when we went to them for support they were able to add our very own variant to their miners. * Create a small network with 3 pools among which 2 of them were maintained by Cryptoamity and Anypool who also maintains some of the best mainnet pools. We would really like to appreciate their efforts and patience during the testing phase of V4. By now everything is ready for this new CN/XTL algorithm and you guys can all test it out and get some accepted shares to keep everything ready so that everything goes smoothly during fork. A list of testnet pools will be updated along with the message. Our team gained a lot of expertise in this area of creating a variant of the Cryptonight algorithm and in future if we are required to change it again we can do it with much less effort since we already know where each part of the puzzle fits. We changed the way how difficulty works when network is under high fluctuations of hashrates. The idea is to increase difficulty by a factor when blocks are found quickly. The more number blocks are found fast, the more the factor increase making block steal harder to be done. As many coins got some attacks over the last few weeks, our team has also worked on a tool for the real time detection of attacks on the network and have a better idea of what's happening over the entire network. This tool is still under development but will help not just us but also every CN a lot to check if blockchain is going ahead in a safe way. At some times, some transactions took some times to be managed by the network and users were waiting for some times to get their transactions mined. We decided to increase this to help the network manage more transactions per block and give a better user experience for each one of us. GUI Miner have been updated to be able to mine old V3 and new V4. The new miners comes with 2% fees(for stak) and 2%(downgradeable to 1%) in xmrig shared half with XTL team and half for xmrig or xmr-stak. The reason such a decision was made was to help our team get funding for some of the effort we put into the project and also help us pay for some of the things like servers etc. what is a more precise date/time or block heigh of the fork? I've got couple hundred dollars worth of coins hanging out on TO. They're fun to toss around when they look like they're dipping or spiking. precise date will be released soon for now I can say 1 week. Thank you for the announcement thread to state about current progresses of the Stellite project. 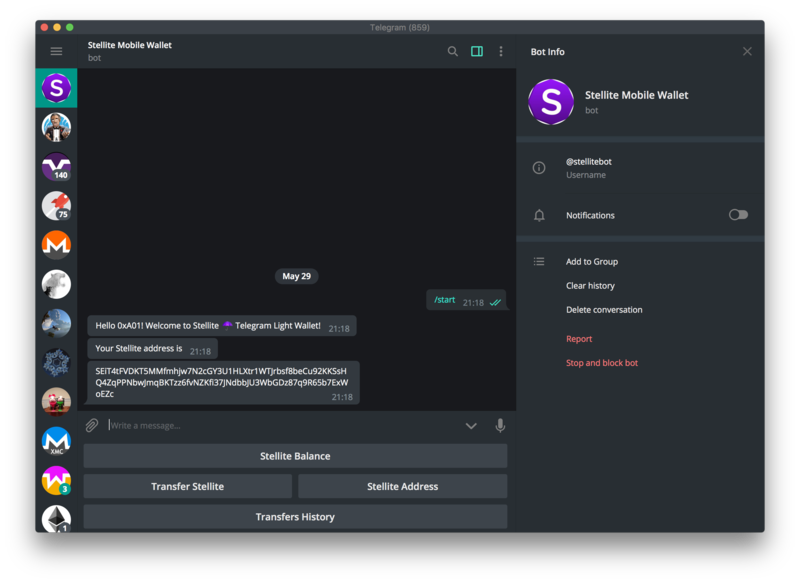 It is also good to see that Stellite Pay and Mobile have been under-developed. dumb question... will I need to update my wallet after the fork if I want to spend my coins i made under v3? You'll need to update wallet, resync the whole blokchain and update the minning software. Hope this is worth the effort.